Bobby and Ysha Bass aren’t chefs but they are cooking up a hot creation. A collaboration between the Basses and some of the area’s top chefs, MESA will spin dining, cooking demonstrations and retail in way they’re betting foodies will eat up. MESA (Spanish for “table”), located at 216 Pearl Street in New Albany, is intended to bridge the gap Bobby sees between kitchen and table. “Because chefs are usually so busy in their kitchens, they don’t have an opportunity to build a relationship with diners. We want to change that for guests and for chefs. At MESA, consumers will interact with chefs and the chefs will have a platform to engage with people, to see the look on their faces as they eat, to establish a bond and, ultimately, bring those people back to their restaurants,” he says. The Basses, who own the Bass Real Estate Group and live in Southern Indiana, chose New Albany as the location for MESA because of the city’s revitalization, history and character. MESA is partially modeled after the concept of a “chef’s table,” at which guests sit in or near the kitchen so that they have an intimate experience with the staff and preparation of the food. Chef’s tables can come with an exclusive haughtiness, but MESA is being designed to be inclusionary and fun. Up to 20 or 25 guests will sit around a demonstration area that replicates a high-end, comfy residential kitchen. They’ll be able to chat with the chef and become active participants in the culinary performance. Visiting chefs on MESA’s line-up include Josh Moore of Volare, Peng Looi of Asiatique and August Moon, Scott Dickenson of The Exchange Pub + Kitchen, Darnell Ferguson of Super Chefs, Bobby Benjamin of Butchertown Grocery, Dallas McGarity of The Fat Lamb and Patrick Carter of Brooklyn & The Butcher. Joining them as MESA presenters will be “in-house” chefs Liz Martino of Adrienne and Company and Richard Brittney. Ysha’s father, Rod Juarez, below, is MESA’s general manager. In addition to hosting breakfasts, brunches, lunches and dinners, MESA will be available for birthday parties, bridal showers and corporate events. Guests who want to cook like a pro and would like to outfit their kitchen similar to MESA will be able to purchase the same appliances at Bonnycastle Appliance and TV. MESA’s retail pantry will stock olive oils, vinegars, rubs, chocolates, teas, infused salts and sugars, and a plethora of other nonperishable items. The pantry also will be a don’t-miss spot for equipping and dressing up your kitchen with cookware, utensils, novelty items and cookbooks. MESA is scheduled to open in late June. For more details, check out mesachefs.com. You’re the chef and owner of The Fat Lamb and are one of the first chefs to be featured at MESA. Yes, I’ll get to cook for and talk and hang out with people who are really into food. That’s cool. 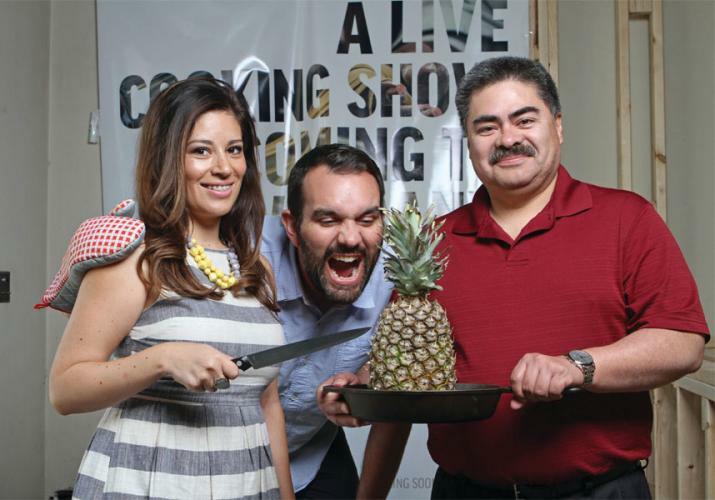 Chefs, locally and nationally, have become celebrities. Some have supersized egos. How do you feel about the celebrity culture of chefs? And, be honest, do you have a mini, medium or giant ego? That culture is a little ridiculous and romanticized. After all, we’re talking about restaurants. Whichever chefs you love, remember they have a team that makes it all happen. Also, the life of a chef isn’t that glamorous. When the dishwasher breaks, you’re fixing it. Ego? I don’t think I have a big one at all. I’m pretty humble and like my team to get the accolades. You have been very open about your humble beginnings in South Carolina. How have they influenced you? I appreciate everything that has happened to me. I know what it took to get where I am in my career. All the hard work was worth it. What’s your favorite dish on the menu at The Fat Lamb? Black spaghetti with white wine butter sauce, fresh cherry tomatoes and seared shrimp. But I like every dish we serve. I’m solid with the menu. Let’s pretend you’ve won a prize to have dinner anywhere in the world. Where would you go? Duke’s Barbecue in Orangeburg, South Carolina, is a nostalgic place for me. I went with my uncle and granddad every Saturday. We’d have barbecue and sweet tea and sat at gigantic picnic tables. It’s a good old country place where everyone knows everyone. That’s what the restaurant business is for me. It makes me happy.